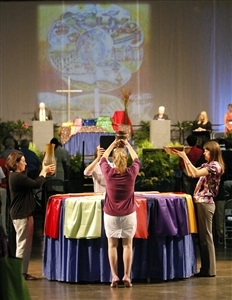 A table bearing the Bible and symbols of the sacraments formed a colorful centerpiece for the opening of the 169th Florida Annual Conference on June 1. As Bishop Timothy Whitaker consecrated the meeting hall, attendants brought the Bible, a plate and cup and a water jar to the central table, draped with multicolored cloths and bearing a large candle. Delegates then got down to work, electing the first clergy delegate to represent the Conference at next year’s General and Jurisdictional conferences. The theme of the Annual Conference is Living as Peacemakers, and the keynote speaker for the Conference was the Rev. Dr. Daniel Bell, professor of theological ethics at Lutheran Southern Seminary. Bell laid down two principles in his address, that Christ is our peace and that the peace of Christ must be reflected in the life and actions of the church. The Rev. Ron McCreary, pastor of Gray Memorial UMC in Tallahassee, said his church participated in an anti-cyber-bullying program to help young people realize the damage they have caused. The Rev. Nora Ramirez said a Kairos prison ministry program had helped two women inmates ask forgiveness of other inmates they had harmed. The Rev. Audrey Warren, pastor of Branches United Methodist Church in Florida City, a multi-ethnic congregation, recalled how her church had been destroyed about a year ago in a fire set by an arsonist. “The next Sunday we had communion, and we invited people to come and partake, but only if they were willing to forgive the person who did it. On the anniversary of the fire, we had a celebration, and we all marched in peace,” she said. The Rev. Dr. Daniel Bell Jr. 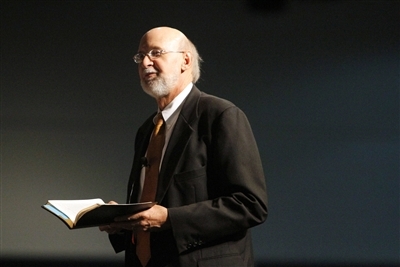 The Conference is being held in Tampa in preparation for next year’s General Conference of the United Methodist Church, which will also take place in the Tampa Convention Center. A major item on the agenda this year is the election of 11 clergy and 11 lay delegates to the 2012 General and Jurisdictional conferences. Balloting for the delegates got underway promptly after the opening ceremonies. Conference leaders decided to use electronic voting this year in hopes of making the process go more smoothly, but there were technical glitches, especially with the laity voting. The clergy completed two ballots, electing its first delegate, the Rev. Jorge Acevedo, pastor of Grace United Methodist Church in Cape Coral. Acevedo will be the leader of the clergy delegation. The laity completed only one ballot, with no nominee receiving the necessary number of votes. Sharon Luther, the Conference Lay Leader, led the voting, followed by Conference treasurer Mickey Wilson and Associate Lay Leader Russ Graves. The nominees for General and Jurisdictional conferences were present at informal gatherings on Tuesday and Wednesday to meet delegates and answer their questions. Several of the nominees expressed the desire to put divisive issues aside and work for more unity in the church. 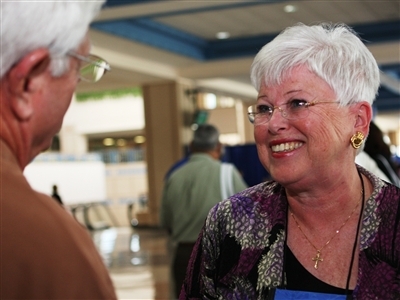 Luther, a member of Cypress Lake UMC in Fort Myers, said she has been prepared to serve as a delegate to General Conference over the past three years by serving as the Conference Lay Leader, representing the Conference at General and Jurisdictional church functions. She said as a delegate to General Conference, she would push for reforms. “I hope we’re gutsy enough to make the changes the United Methodist Church needs to make, to make disciples and not worry about structure. I’d like for us not to be afraid. I think God is saying, ‘My church needs to change,’” she said. 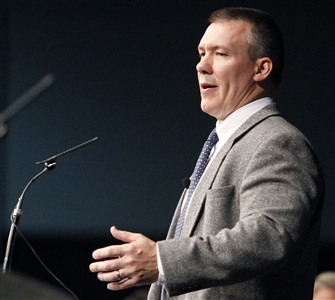 Rod Groom, a lay nominee who is a member of First United Methodist Church in Fort Pierce, where his wife, Shirley, is pastor, said he was moved to become a nominee in part out of a love for Wesleyan theology. An emphasis on local ministry was also the concern for the Rev. Tom Nelson, pastor of First UMC in Port Orange. “I’ve served in some tough places. I spent six years in Miami. The needs of the church are what it’s all about. My issue is churches reaching out to their immediate communities,” he said. The Rev. Bill Bailey, pastor of Rogers UMC in Bradenton, said he became a nominee for the first time because “it’s always the same people” who are elected. “It’s time for new voices,” he said. Bailey echoed the desire for more unity.